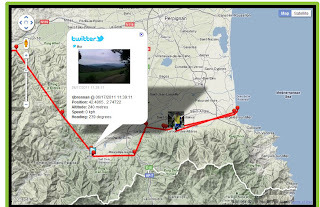 We’ve just released an exciting update to the My.ViewRanger.com online community and route planning website. My.ViewRanger lets you discover, create, and share your outdoor adventures, and synch these wirelessly with your ViewRanger app on Apple, Symbian, and Android smartphones and tablets. 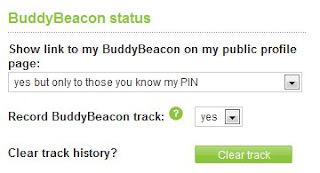 When you are out and using ViewRanger BuddyBeacon, you can now have ViewRanger automatically show a link to your BuddyBeacon tracking page on your profile page within the ViewRanger online community site. Let the ViewRanger community site tell your friends that you are outside! Privacy controls are included in your Profile Settings page to control whether this is active or not. Your BuddyBeacon track can now automatically show along its length all (or selected) tweets and tweeted photos that you post whilst out on your trip. Simply add your Twitter details to your community site Profile Settings page. If you don't want all your tweets shown on your BuddyBeacon track, you can control which Tweets are shown by specifying a #hashtag - I use #vr. You'll then see only the tweets that are sent containing this hashtag. For photos, Instagram, Flickr, Twitpic, Twitgoo, and Twitter's own new photo sharing service are currently supported. We have added four ViewRanger “widgets” that make it quick and easy to share your routes, tracks, and more through your own web sites, blog posts, facebook page, and more. Use this to share your ViewRanger profile page with family and friends. This badge links to your public profile page and dynamically shows your profile image and the number of routes that you have published into the ViewRanger community. Use these widgets to embed maps of a route that you have published, tracks that you have uploaded, or perhaps show off the route you plan on using at the weekend. Ideal for blog posts and trip reports. Use the Search widget to embed a dynamic map with many routes. This widget will replicate the filter settings you have applied – making it easy to embed a map that shows just your published routes, or that shows cycling routes nearby your local town that are shorter than a certain length. If you are a guidebook publisher, tourism organization, prolific community publisher, or other route publisher then this widget makes it simple to add your route content into your web pages, blog posts, and facebook pages. It’s also a great way for campsite owners, hotel and bed & breakfast operators, outward bound centers, and other places to embed an interactive map of high quality outdoor route guides in your own websites – a powerful way to show your visitors what is around you! You’ll find code snippets on your community home page (for the Profile Badge), on every published route map page, on every track map page, and on the route search page. Simply copy the code snippet and add it into your web page, blog post, or a facebook HTML iframe page tab. We have also improved the text search on this page – so that it will search the route name, summary, shortcode, and publisher name fields for matching terms. You can now delete unwanted tracks that you have uploaded to your account from your handset. It is now quicker to create a route for your own private use, as you no longer have to enter a summary description and other details before saving your private route. You can simply plot the waypoints in the website's route editor, tap the save button, and then use the ViewRanger app to synch it directly to your mobile device. Published routes - i.e. those shared with the ViewRanger community - still require descriptions and other information to be completed before they can be successfully published. We have added a full list of the routes that you have downloaded into your Routes and Tracks page. We have added a "View All Routes" button to every public profile page. This makes it simple to go to a map showing the location of all the routes that have been published by that author.